KOKOMO, Ind. — Economic development leaders in north central Indiana expect to combine efforts, as soon as March 2013, to attract business and industry to the area. This decision follows a series of meetings hosted by Indiana University Kokomo to work more closely as a region for economic progress. 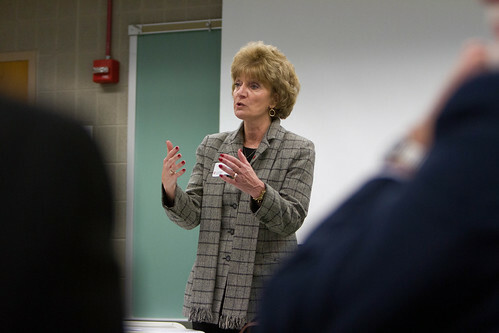 Interim Chancellor Susan Sciame-Giesecke leads the meeting. See more photos.Interim Chancellor Susan Sciame-Giesecke recently facilitated the second meeting among county commissioners, county council members, mayors, and economic leaders in six counties, leading to agreement on a Comprehensive Economic Development Strategy. The next step is for the county commissioners in Cass, Clinton, Fulton, Howard, Miami, and Tipton counties to approve the plan. After that, local economic development leaders will present the regional planning organization's bylaws, funding formula, and other foundations for approval. IU Kokomo's participation is part of its mission to lead and support regional economic development. "We're being pioneers here, to build opportunities for our region," Sciame-Giesecke said. "IU Kokomo will continue to be available through this process." Jim Tidd, executive director of the Miami County Economic Development Authority, said all the counties will benefit from regional economic marketing. They have more access to federal and state grant money as a region, and benefits of development in one county are shared across county lines. "We believe a project in one county benefits all the counties in the region," he said. "A regional planning organization is needed to take this region to the next level." Connie Neininger, president of the Logansport Cass County Economic Development Foundation, said having a strategy and regional planning organization helps developers think outside their own county. "It helps the whole community look beyond just today. It gives you a focus for growth."